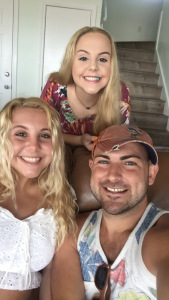 My son, Zachary, and daughter, Krista. Like many women, I’m a mom with kids of both genders, one son and two daughters. And like most moms, there’s nothing in this entire world that I wouldn’t do for them, nor is there anything in this world that they could do or say that would ever change my love or devotion toward them. I think by and large though there are monsters that live amongst us, most parents feel this way, and worry about those types of things all of the time. We want to protect our children from the horrors and dangers of this world, and of course, we want to protect them from any negative things that we know as kids, young people, teens, they could face as they grow into adulthood. Once they reach adulthood, we tend to breathe a little easier, but sometimes life can throw hardships at them during adulthood as well. Time for me, like everyone else, flew by too quickly as my children grew. I don’t believe they will ever realize what a joy they were to me, and my husband, but since I had the luxury of working from home especially to me! Now, if you were to ask my girls they would say, “My mom worked all the time, she was always busy.” To the degree that statement is true, my kids like others forget the good stuff and often focus on anything negative. They have forgotten the days that I played hooky to take them to the local zoo, up the street to the park, a movie, or just to have a tea party in their bedroom. We had so many tea parties and trips to the zoo; great memories! 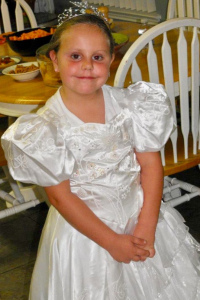 My daughter, Lauren, when she was a little princess, right after a tea party. I knew the time would come when my gorgeous little girls would turn into beautiful young ladies, teenagers. In a world that revolves around social media and kids growing up too fast, that thought terrified me. What scared me more than that was knowing that someday they would, like most girls, experience their first real heartbreak. My son, the oldest, experienced his first real heartbreak later in life, a marriage dissolved, though devastating to witness he continues to amaze me. A fantastic father, hard worker, and he defines courage and strength. Some would say teenage heartbreaks are a rite of passage; it’s going to happen, and every girl at some point will experience it. I agree. It does seem that way, and I suppose most girls do have their hearts broken during their teen years. Both of my girls eventually went through the broken heart experience. I can honestly say even though I knew my teens would recover, bounce back, date again, get over it, at the time the breakups were occurring, to them, it was the most devastating thing that had ever happened to them in their lives. As their mom, my heart broke for them. I couldn’t fix it. Take away their pain. Stop them from feeling awful about themselves, questioning what had gone wrong with the relationship or searching for answers they were never going to find. I couldn’t stop them from trying to reach out to the person that had hurt them, even though I felt it was the best thing for them that the relationships were over. There wasn’t enough ice-cream, movie days, cuddles on the couch or tears shed to make them feel better. It was a crushing blow to them; even though as a parent and adult, one knew it was going to happen. Did they get over it? Yes, they did. Did they move on with other people? Yes, they did. Will they likely be hurt again? I’m sure at some point they will. But as a mom of two beautiful girls and one handsome son, I’d give anything in this entire world if they could avoid not only that pain again but what that kind of hurt does to them. It’s the kind of pain that causes them to question themselves and the beautiful people that they are growing into and will turn out to be as individuals. The type of heartbreak that suddenly makes these beautiful people of all things insecure. The kind of pain that forces them to change who they are or to try and fit into someone else’s mold or an idea of who others think they’re supposed to be????? That’s what breakups sometimes do; make people of all things question themselves instead of the other person, and that can take a toll on impressionable teens. I believe my kids learned from their breakups. The types of people that had caused them such pain are people that they will choose not to associate with again. But as a parent, if I could do anything in this world to spare them such pain, I’d do it without hesitation and never look back. One of my daughter’s, great big beautiful eyes, tears rolling down her cheeks, looked at me and said, “I am so sad, mom. My heart literally hurts.”…Looking at her, watching her in pain and knowing I couldn’t help, well that hurt MY heart.